Taken at face value (so to speak) as a collaborative art project this is very similar to The Sheep Market, and it produced results that were colorful and entertaining. However, behind all of the pretty faces there’s something even more interesting. I was in transit and didn’t get to see the HIT myself, but based on reports from my earthbound colleagues I’ll describe it to you. Each HIT used an IFRAME to host an instance of VNC. VNC provides a virtual view into a running copy Linux. In this case the copy of Linux was running on Amazon EC2 and hosting a paint program in a locked-down environment. This is some pretty potent stuff and I can think of lots of ways to use it. 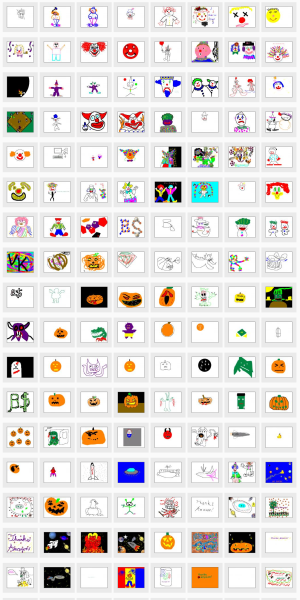 Some of my favorite web sites offer “drawing contests” on a regular basis. The details vary from site to site, but each one requires entrants to offer a creative interpretation of a particular theme. In order to participate entrants must have a drawing program and a place to host their finished work. As this exercise in clown-generation has shown, this is no longer the case. The ability to dynamically and economically host many instances of a powerful drawing or painting program like The Gimp or TuxPaint, collect the results (maybe even storing them in Amazon S3) would work really well in a classroom or training environment. What about a new problem-solving site for developers or system administrators? How about contests to optimize a MySQL database query, solve a thorny networking issue, fix an Apache configuration file, or to debug a complicated bit of Perl code? Wrap some forums around these and pay for it all with some keyword-powered advertising and you could have a nice money machine. Yes this is a great mashup, and it is also a great example of crowdsourcing. PS – Some of those clowns look like pumpkins. Clearly, the raw images could be passed through Mechanical Turk with a request to flag the clowns as such. This application was developed by Santa Cruz Tech. Through their Von Kempelen identity, they offer consulting and custom development work for companies looking to use the Amazon Mechanical Turk. Turns out that they also asked for dolphins, logos, spaceships, and monsters.